Gross weight was an average of 174.7kg in October 1999. It was the range of 138-213kg by the quantity of a kitchen garbage. The total amount of kitchen garbages was an average of 120.7kg in October 1999. It can be processed in 89-161kg. It performed processing 5 minutes or more at 85 degrees C as a standard of an end. Then, processing was performed 4 times in 4 hours and 30 minutes. 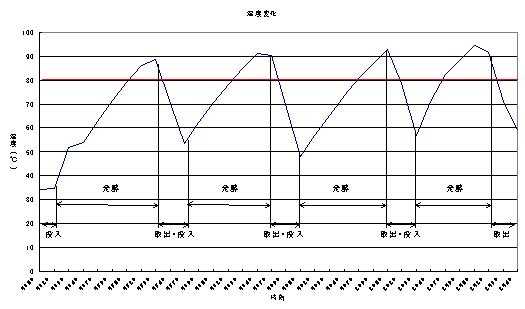 There was little temperature descent according to a raw-material injection by the heat capacity which a machine holds from the 2nd time. The temperature of 90 degrees C was obtained on the average from the 2nd time. It turns out that an effect goes up this equipment more by intermittent continuation processing. Processing was performed 6 times in 510 minutes. The average of one processing was 85 minutes. The supplied material is as follows. The amount of processings per hour was 71.3kg of kitchen garbages since a kitchen garbage is 606kg. (1)The fermentation temperature of over 100 degrees C.
Temperature became over 100 degrees C by completely sealing. Temperature reached to 120 degrees C in about 3 hours. 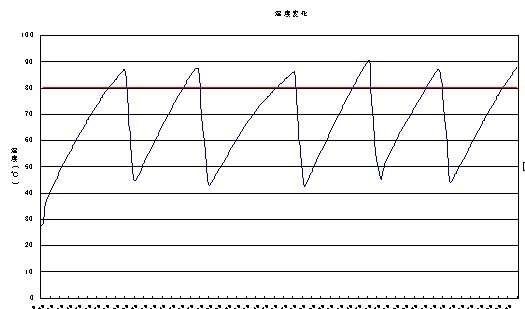 (2)Cultivation at the fermentation temperature of over 100 degrees C.
It sampled and cultivated in normal temperature in order to check whether it is sterile. However, it not think this time whether it is a fermentation bacillus. As expected, it was negativethere and no pathogenicity. It was surprise that even the fermentation in the situation where it sealed was aerotropism. However, it can be aerotropism even if it has sealed. It may reach by 120 degrees C, changing the situation of a bacillus.